On Tuesday 29 November 2016, Rare Disease UK held a briefing session on rare, genetic and undiagnosed conditions in the Scottish Parliament. The session was sponsored and supported by Bob Doris MSP and brought together a number of key stakeholders and Members of the Scottish Parliament (MSPs). The meeting began with a pre-recorded welcome message from Alastair Kent OBE, Chair of Rare Disease UK who spoke about the progress that has been made in Scotland to put into practice ‘It’s Not Rare to Have a Rare Disease: The Scottish Implementation Plan’. Alastair also spoke about the commitment that has been made to improve services for rare disease patients in Scotland through the work of National Services Division, the Scottish Medicines Consortium and the Chief Scientist Office. He also discussed work of the Cross Party Group on Rare Diseases in the last Parliament and the importance of reconvening this group as the Cross Party Group on Rare, Genetic and Undiagnosed Conditions in 2017. Those in attendance also heard from Fiona Murphy, the Director of National Services Division in Scotland. National Services Division is responsible for commissioning and overseeing Scotland’s National Screening Programmes, Specialist Clinical Services and National Managed Clinical Networks on behalf of the NHS in Scotland. Fiona noted that this work is influenced by the Scottish Rare Disease Plan and that good progress has been made towards meeting the objectives of the Plan. Dr Alan McNair, Senior Research Manager for the Chief Scientist Office (CSO), gave a presentation on how research into rare diseases in Scotland is supported. He shared information on the CSO’s Health and Social Care Research Strategy, which aims to increase the level of high-quality health research conducted in Scotland, and spoke of the importance of collaboration with patient organisations. Dr McNair shared specific examples of collaboration including work with a number of our supporters, including: Action Duchenne, Muscular Dystrophy UK, the Scottish Huntington’s Association and the Progressive Supranuclear Palsy Association. The meeting was attended by MSPs with a strong interest in health issues in Scotland. 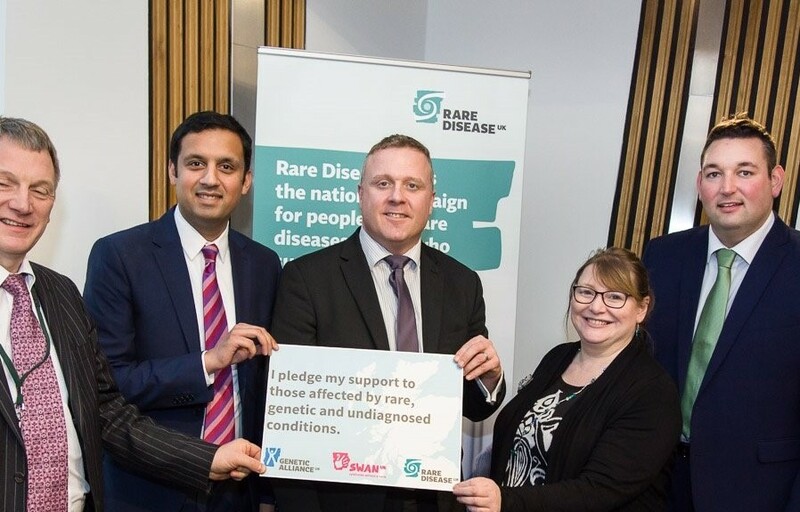 We were grateful to have Bob Doris MSP, Clare Adamson MSP, Miles Briggs MSP, Ivan McKee MSP and Anas Sawar MSP in attendance and grateful for their pledge to support families affected by rare, genetic and undiagnosed conditions in Scotland. Many other MSPs, who were unable to attend the briefing session, have asked to receive briefing packs and to meet with Natalie Frankish, Policy and Engagement Manager for Scotland. The event also provided the opportunity for MSPs and policymakers to hear from those affected by rare, genetic and undiagnosed conditions. SWAN UK member Wendy Meek shared the experiences of two of her children, Justin and Charlotte Lily. Justin passed away when he was ten years old and Charlotte Lily, who is five years old, has an undiagnosed life-limiting genetic disorder. Wendy spoke of the difficulties that arise for patients affected by an undiagnosed condition and their families in receiving the appropriate care, support and information, and accessing appropriate clinical expertise. As well as outlining the emotional and stressful journey that their family has been on, Wendy shared her hopes for a diagnosis for Charlotte and spoke about the impact becoming a member of SWAN UK has had on their experiences. She explained that SWAN UK has been a lifeline, and that the community has offered her family an incredible amount of support and made her realise that their family is not alone. Ena Mitchell spoke about the challenges of living with the rare liver condition Primary Biliary Cirrhosis (PBC), and how difficult it can be to access appropriate support and information when the condition you have is rare. She also spoke about her life changing liver transplant. Yvonne Hughes, Policy Adviser for the Cystic Fibrosis Trust in Scotland, spoke of her role and shared her experience of having Cystic Fibrosis, a congenital condition that affects 1,000 people in Scotland. Yvonne spoke of the need for patient access to clinical trials and treatments, and the important work that is being undertaken by patient organisations to support the Scottish Government and NHS Scotland in delivering high quality care and services to patients with rare, genetic and undiagnosed conditions.